The rain is gone, the smog has cleared (for now), and it’s going to be a hell of a weekend. 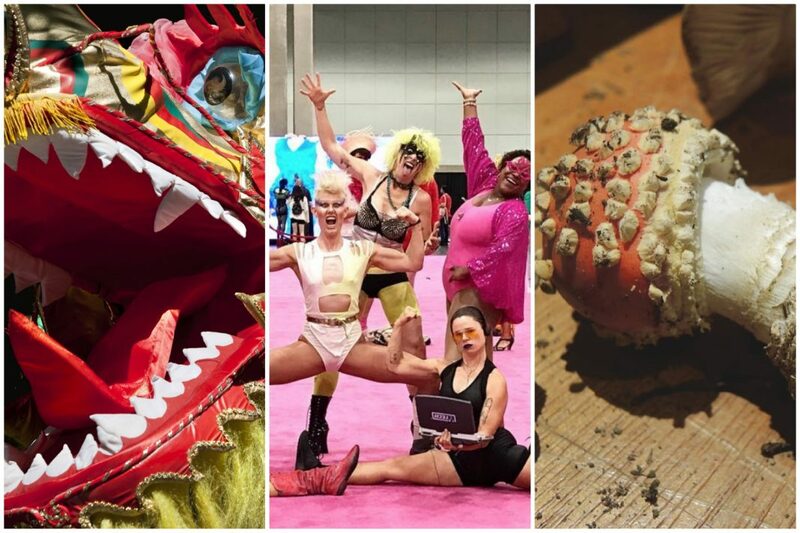 Ring in the Year of the Boar with a slew of fun things to do. It’s a Friday night and you were going to go out for pizza anyway, so why not see some comedy while you’re at it. Every Friday, DeSano Pizza Bakery in East Hollywood hosts this comedy showcase with an ever-changing lineup. This week Eric Lampaert, Stephen Agyei, Mary Jane French, Tess Barker, Jay Whittaker, and Sabrina Jalees perform, and Babs Gray hosts. Come for the $5 beer and legit Neapolitan pies, and stay for the yucks. You’ve heard of GLOW, but have you heard of F.L.O.W.? The Future Ladies of Wrestling are the opposite of a blast from the past. Outrageously costumed grapplers with names like Candy Pain, Chemtrails, and Flesh Eating Corpulous hit the mat for a good cause at Zebulon on Friday night. Proceeds from the balls-to-the-wall bout go to Women’s Center for Creative Work, also in Frogtown. Head to the Fonda Theatre for another year of this bizarro party feting the late Edward Gorey. This year’s festivities, inspired by the author-illustrator ’s burlesque The Epiplectic Bicycle, include drinking, dancing, and playing parlor games till the thought of a steam-powered tea garden sounds normal. Outlandish costumes encouraged. The year of the boar is upon us and Chinatown is going whole hog on Saturday. The festival in Central Plaza features a full day (noon-8 p.m.) of festivities, including music, traditional dance, and Chinese acrobats performing something called “Mongolian contortion.” At 1 p.m., the 120th Annual Golden Dragon Parade kicks off. There’s also a craft market, food trucks, and workshops hosted by local studios and galleries. It won’t be boaring (kill me). Hurston’s newest book is actually quite old: The late author of Their Eyes Were Watching God tried to publish Barracoon in the ’30s only to have the manuscript rejected. The Skirball Cultural Center marks Black History Month with a staged reading of the astounding work, which is based on interviews with the last living survivor of the Atlantic slave trade. Not even joking when I say this: mushrooms are so hot right now. They’ve sprouted up in trendy skincare lines and fancy supplements, but there’s also growing evidence (no pun intended) that mushroom could save the world. On Sunday, the L.A. Arboretum hosts the L.A. Mycological Society’s 35th annual Wild Mushroom Fair, featuring a cultivation demo, a mushroom display, and a cooking demo from Matt Molina of Hippo in Highland Park. Don’t like mushrooms? Eh, they’ll grow on you.